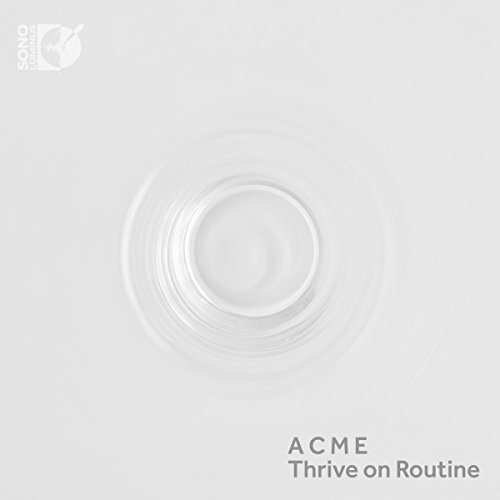 In many ways, this album represents the debut recording of ACME, American Contemporary Music Ensemble. The collection of pieces here was chosen for very pure and simple reasons; each work is a piece we love and to which we feel quite intimately connected. The performance of this music is an expression of affection and closeness, not just to each other as performers, but also to the composer who wrote it. Three of the four composers featured are also performers in ACME. It is music that feels very close. This curated selection of pieces comes from different but rhyming sonic worlds and is some of the music we have grown to love the most in this varied and fast-changing world. The American Contemporary Music Ensemble (ACME) is dedicated to the outstanding performance of masterworks from the 20th and 21st centuries, primarily the work of American composers. The ensemble presents music by living composers alongside the classics of the contemporary. ACME's dedication to new music extends across genres, and has earned them a reputation among both classical and rock crowds. NPR calls them "contemporary music dynamos," and The New York Times describes ACME's performances as "vital," "brilliant," and "electrifying." Time Out New York reports, "Artistic Director Clarice Jensen has earned a sterling reputation for her fresh, inclusive mix of minimalists, maximalists, eclectics and newcomers." ACME was honored by ASCAP during its 10th anniversary season in 2015 for the "virtuosity, passion, and commitment with which it performs and champions American composers." ACME's instrumentation is flexible, and includes some of New York's most sought-after, engaging musicians. World premieres given by ACME include Ingram Marshall's Psalmbook, Jóhann Jóhannsson's Drone Mass, Caroline Shaw's Ritornello, Phil Kline's Out Cold, William Brittelle's Loving the Chambered Nautilus, Jefferson Friedman's On in Love, Timo Andres' Senior and Thrive on Routine, Caleb Burhans' Jahrzeit, and many more. ACME has recorded with Max Richter (Sleep, 2015) and Jóhann Jóhannsson (Orphée, 2016) for Deutsche Grammophon, as well as for Butterscotch Records (Fantasias for String Quartet and Theremin, 2016), New World Records (Joseph Byrd: NYC 1960-1963, 2013), and New Amsterdam Records (On in Love, 2014 and Loving the Chambered Nautilus, 2012). The ensemble's many collaborators have included The Richard Alston Dance Company, Wayne McGregor s Random Dance, Gibney Dance, Satellite Ballet, actress Barbara Sukowa, filmmaker Jim Jarmusch, Blonde Redhead, Grizzly Bear, Low, Matmos, Jeff Mangum, A Winged Victory for the Sullen, Roomful of Teeth, Lionheart, and Theo Bleckmann.